As I speak to CISOs and security teams I’m often reminded of how difficult their jobs are. They are under tremendous pressure to manage risk while securing their environment, to build security teams with limited budget, to enable new technology and new business opportunities. They are also faced with the challenge of hundreds of security vendors with new and old products all looking for their time and their budget. It is very difficult for them to determine who to trust and who to partner with to secure their environment. This is where the Department of Yes comes in. 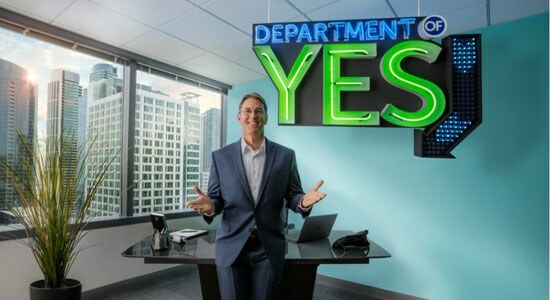 Enabling the Department of Yes as not just a marketing message but a mission and one that we strive to achieve with every customer. Customers’ needs and skills vary but they are all looking to say Yes. Many customers still need help with the basics, they need to understand where to start, what to prioritize, what they should do themselves and what they should look at from others. Other customers are more mature, and they need to understand how they should plan to secure and embrace the future. But the common theme is they are looking to enable the business while making it more secure. Security is like brakes on a car, we put brakes on a car so we can go faster not slower. Identity and access management and network security are examples of security that enables the speed of business and enables the department of Yes. Think of what are customers can do if you have a secure network solution that you can trust, one that inspects every packet, one that has a team of engineers making sure that updates occur and that the latest threats are mitigated. That knowledge allows our customers to expand their businesses, provide high speed trusted connections everywhere, to expand their networks with continuing increased bandwidth and to provide great service to their customers. Identity and Access Management is also key to saying YES. If you govern every identity you are providing access to the right people to the right resource at the right time. This enables on customers to manage their customers, their users and their partners. They can expand into more regions, take on more employees, utilize more contractors and embrace more partners. Becoming the Department of Yes comes in many forms. It comes by building the best products and solutions, it comes from embracing partners and customers and helping them succeed.